Finally a near alternative of Microsoft Office /Libre/Open etc. is available in Kingsoft Office which is available for all Debian based Distros like Ubuntu 13.04/12.10/12.04/Linux Mint 15/14/13. I have successfully installed it. It is also available in RPM package for Fedora and the like distros. The screen shot is on the left. Kingsoft Office is an office suite developed by Hongkong/Chinese software developer which was until now using the brand name WPS (with website at wps.cn and appears to be an acronym for Writer, Presentation & Spreadsheet). It includes three components like Kingsoft Writer, Kingsoft Presentation and Kingsoft Spreadsheet. Kingsoft Office personal version is completely free. Professional version comes with a price tag of 22 Euros. With the Kingsoft Office suite, we can view, edit, and send Microsoft Office documents, presentations and spreadsheets on Linux. This offers most of the features and functionality like Microsoft Office. The Kingsoft Office main interface includes a row of icons similar to a word processor or spreadsheet editor. It also features additional skins which also includes skins similar to MS Word. It handles all the latest Microsoft Word, Excel, and PowerPoint file formats as well as text and PDF files. 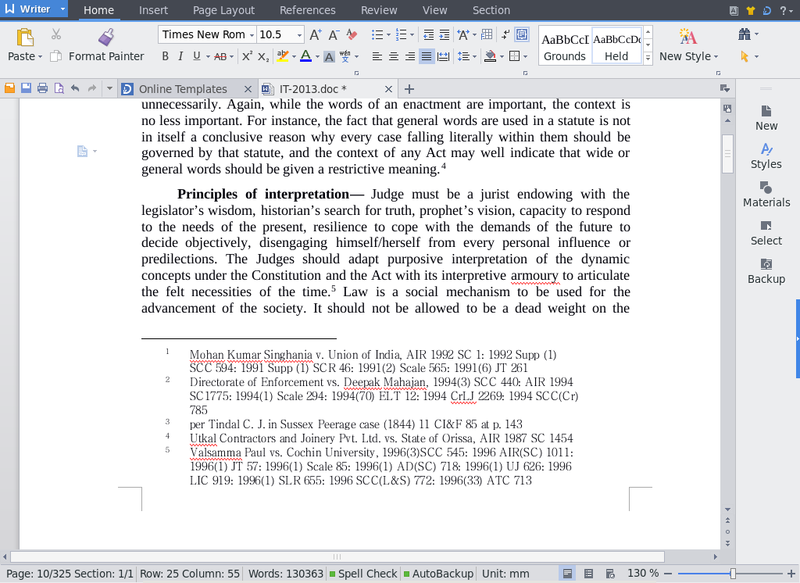 So far it has worked well in opening and showing MS Word files exactly like MS Word itself. Libre/Open Office was not able to open similar files in exactly same way. These files included complex frames, foot notes and variety of fonts. So far no problems were encountered working with the files. Of course there were no problems in adding or editing text or making other modifications. However it was not comfortable with links within the document. Though it could read the bookmarks. We are looking forward to see if it can truly replace all functions of MS Word. BTW it also has Android and Microsoft Window and iOS versions available at ‘kingsoftstore.com’. Linux version is a Beta and is available only at wps.cn. For other Distros like Fedora or Red Hat, RPM file is also available Download and install it with the package manager or command line like ‘yum install *.rpm’ But check up before doing that as I do not use Fedora or Red Hat type distro. It is done. Enjoy and please take pain to share the problems solutions and workarounds. Note: Take time to read this error problem before you may try to rely on these packages. This entry was posted in Linux/Ubuntu and tagged computer, Debian, doc files, Excel, Fedora, Kingsoft Office, Linux, Linux-Mint, Microsoft Office, microsoft office documents, Microsoft Word, Office suite, RPM, Software, spreadsheet editor, technology, Ubuntu. Bookmark the permalink. I can’t find it installed. How to run it from terminal after installation? Please try to fix broken dependency first with: “sudo apt-get install -f”. Remember that it is a 32bit version which require elaborate 32 bit library. respect yute free office is definitely better. But free office is non free. It is not easily downloadable. No trial available either. Not agreed, LibreOffice’s compatibility with Microsoft Office files is bad, but after having tried out Kingsoft Office I can’t find it much better. A bit better, yes, but it also messed up a lot of formatting. I had missing or shifted elements, couldn’t open some password protected files, charts and tables looked very different, and such more. Thanks buddy. I will look into free office asap. Wps was not able to show style reference links at all.